Best Deleted Pictures Recovery Software, recovering pictures in 3 Steps! 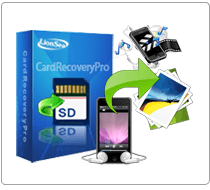 Deleted Pictures Recovery Pro is easy to use recovery tool that ensures absolute recovery of lost or deleted photos, images, videos and graphics from all popular storage devices. The Recover deleted pictures software employs advanced disk scanning technology to completely scan and recover pictures, videos and other media files. Deleted Pictures Recovery Pro is outstanding pictures recovery software which is dedicated to recovering deleted photos from PC hard drive, digital cameras, USB drives, flash memory cards including Compact Flash Card (CF), Smart Media Card, Secure Digital Card (SD), Multi-Media Card (MMC), XD Picture Card (XD), Micro Drive, Sony Memory Stick (Duo, Pro), as well as removable storage including Zip disk, iPods, USB drives and external Hard drives. Once you deleted pictures from your memory card, formatted recycle bin, Deleted Pictures Recovery Pro will be your first choice to choose. On the one hand, Deleted Pictures Recovery Pro is easy to use recovery tool that ensures people to recover deleted photos, images, videos and graphics from all popular storage devices. The tool applies advanced disk scanning technology to completely scan and recover pictures, videos and other media files. With the help of Deleted Pictures Recovery Pro, you can recover formatted photos in only a few minutes. There is no need to worry about how to undelete your deleted pictures. Its interface is not only suitable for computer novices, but also for advanced computer users. 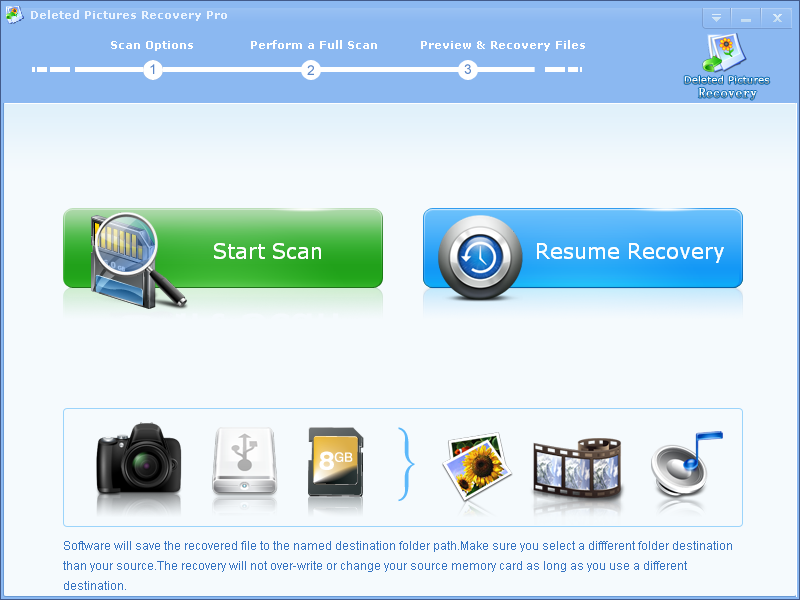 On the other hand, this tool presents powerful features compared with the other recovery software. Deleted Pictures Recovery Pro performs distinguished functions which contain Preview Recovery, Batch Recovery, Safe Recovery and Raw Recovery. Preview Recovery is designed for people to see thumbnail display of recoverable photos or files. 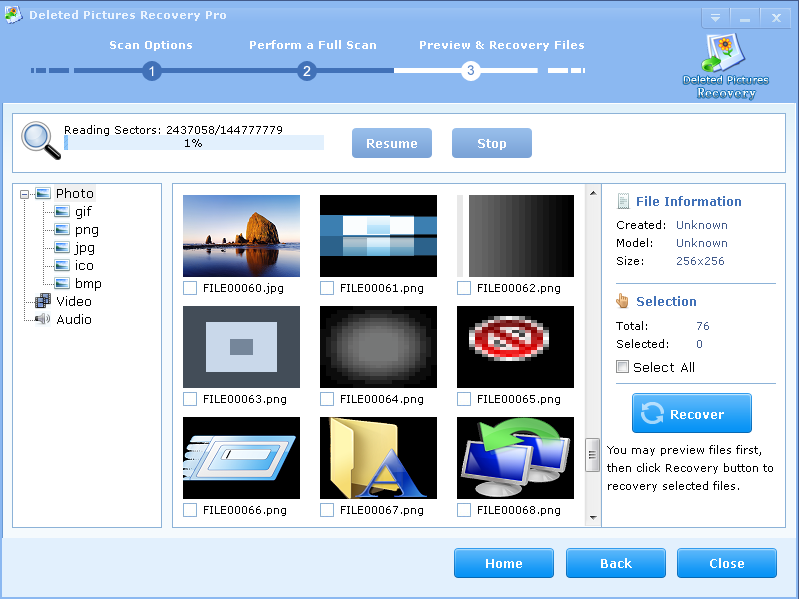 * Deleted Pictures Recovery Pro will undelete all type of photos from your SD card or disk.